I decided the plain white thumbtacks on my bulletin board needed to be cuter. And by cuter, I mean oranger. I put a small piece of washi tape on each pushpin, smoothed out any fine wrinkles with my thumbnail, and trimmed around the edges with a sharp scissors. Cuter! Speaking of cuteness, how about these dolls made from wooden sticks and washi tape? There aren't any thumb tacks cuter than those! What a great idea, thanxx! Ann, slightly. But it might be necessary. Susan, I think you and Ann should be friends. yay! another fun way to use my washi tape stash! Now i know what is wrong with mine! :P The cutest idea ever! Just love it and pin it!!!! commencing mission cover all my thumbtacks with washi in five.. four.. three.. two......... awesome idea! Okay now this is just too adorable. All of it. I'm this close to pulling a *squeee* here. Don't hurt yourself. That sounds like it might be painful. I really like that orange washi tape, where did you get it? washi tape can become addicting. cute idea! That tape can be used EVERYWHERE! 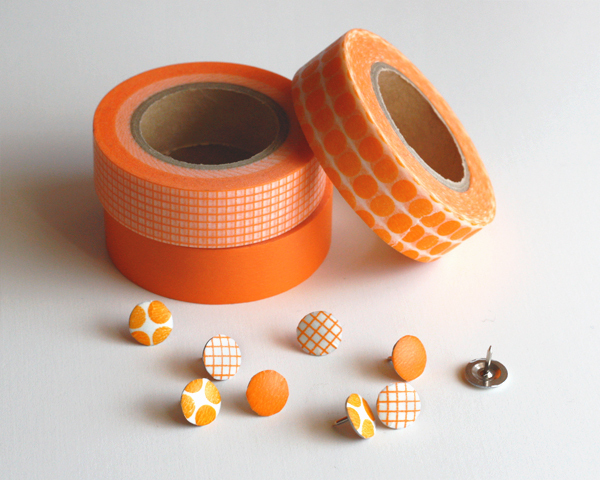 I want this washi tape now ;o) and the thumbtack too! where did you get them? Great idea! The orange tape was a present, so I'm not sure where it came from. I think the thumbtacks were from Target a long time ago. Awesome idea! Love that it emulates the look of fabric tumbtacks, but you can switch up the colors whenever you want (and save a bunch of $--those pretty fabric ones get pricey!). That's a wonderful idea. How you turn the small things into a beauty, I just love it. Love these! But my husband will think I'm crazy if I rush out to replace my push pins with flat thumbtacks. Maybe I'll just recover the circular magnets on my frig instead (for now!). Ridgeway, I got the same washi tape set from Target a couple of months ago, except the cross-hatched roll was yellow. Why didn't I think of that?!?! I'm obsessed with washi tape. I've made magnets with them but not thumb tacks. Great idea! great idea! They are so pretty. Another cool way to use washi tape. Thanks! I only have one orange washi tape and it's not as cute as yours. Where can I find this cute stuff? You know I love the orange. The orange tape was a present, so I'm not sure where it came from. BEAUTIFUL and vibrant. Great for the lack of spring. Love these! You just blew my mind how cool these are. Also, I remember how much I spent once upon a time on a box of decor style thumbtacks before colored/patterned duct tape was even a twinkle in Larry the Cable Guy's left toenail. Awesome way to make some seriously shabby chic! Duct tape style! Don't use the silver thumb tacks... they don't turn out as nice. Also, try to find the flat top ones. "And by cuter, I mean oranger." You and my youngest daughter must be kindred spirits. She loves orange. She says she "likes a lot of colors," but orange is her favorite.